My first loss was a cactus that died to a fungus it probably had before I got it (the autopsy is graphically documented on cactiguide). I had to perform surgery on my saguaro to remove some rot. One of my pricklies suffered a bit of rot during hurricane season, but recovered. I lost a little one, maybe due to rot? at the end of the season. I lost one just a few weeks ago to mealy bugs or something that got in as a result of them (I haven’t autopsied it yet). Out of 25 or so plants of interest, that ain’t bad. It might sound strange, but the fact that my first loss was due to something that wasn’t my fault kept me from abandoning the garden. 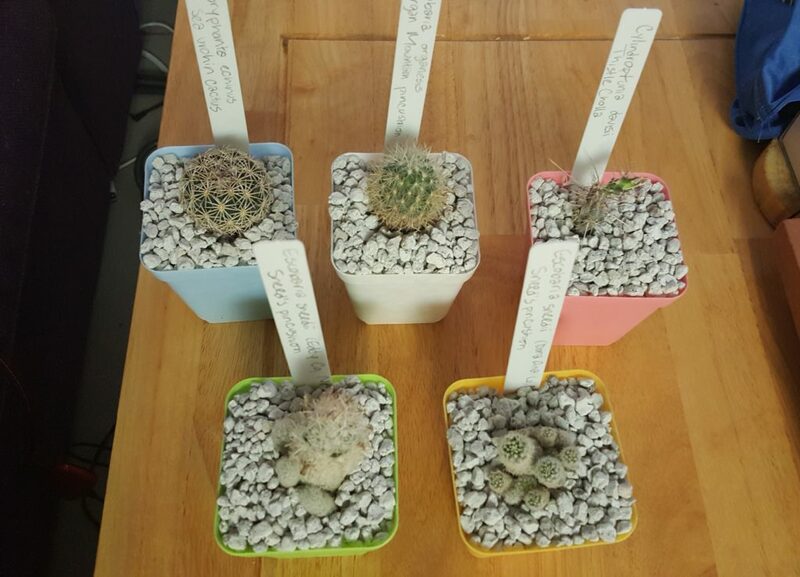 Everyone, everyone says that noobs will overwater their cacti and kill them. And yeah, I did eventually struggle with that. But if my first death had been a cactus I carefully put in no organic soil whatsoever for moisture control and photographed meticulously to check for issues and did a ton of research on before even purchasing… I would have been really bummed. What else could I have done, if I had already done the best I could? With no experience to draw on yet, I wouldn’t have known what factors to change. The fungus was a good way for the first to go. Opuntia phaeacantha “Dark Knight”, early 2017 season. I took a lot of pictures. 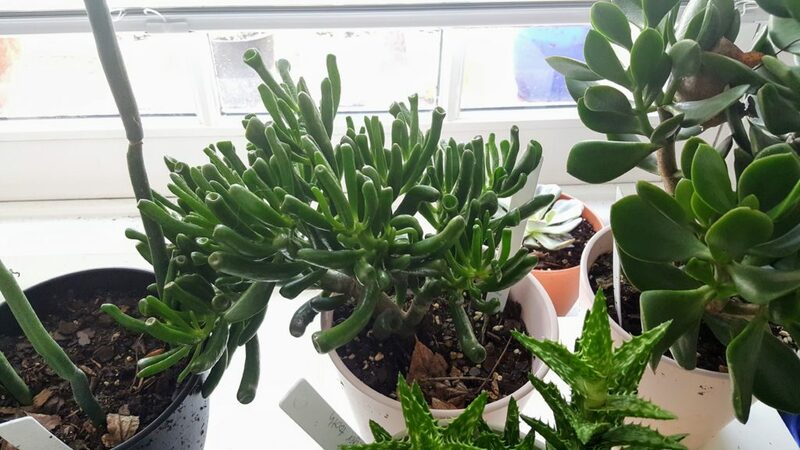 With the slow-growing nature of cacti, the surprisingly fast growth of the succulents, and the uncertainty of whether any of these plants would live, I wanted to see how they were doing. That helped me catch a lot the above issues early (except for the mealy bugs). I was sending a rude number of pictures over Google Hangouts, so I started an Instagram account for select photos. (You can now also see those if you follow me on Mastodon.) I have a ton more weekly photos just stored away, though, stored by plant and taken from the same angles so I can check growth. With the right soil mixture, these plants generally don’t need any attention but once a week, which suits my schedule very well. I’ve churned through more conventional plants this season, too: rosemary, catnip, dill, a false cypress, a few other things probably… all lived and died due to my irregularity in care of them. The cacti and succulents suffered a bit at times, but that mostly meant I probably didn’t get maximum growth out them. Summer 2017 cactus garden additions. In late May and June, Charlotte got a total of about 12 inches of rainfall. Phoenix, Arizona gets about 8 inches per year. Twelve inches felt like a deluge even as someone living here. 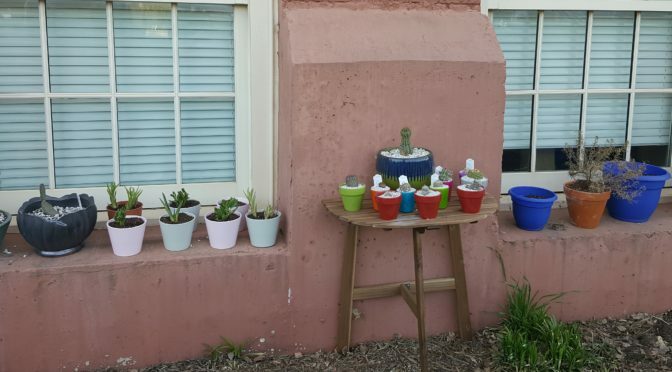 Except for the prickly pears, my cacti are planted in pure pumice (no soil/organics) due to the quantity of rainfall we get here, but all that rain meant I wasn’t adding fertilizer (needed for pumice-only growing), so growth stagnated and I worried about rot constantly. Early fall brought a hurricane pretty close to Charlotte, NC, and the winds were violent enough that I needed to bring all the little ones in, and the rain heavy enough that I needed to bring anything that could get waterlogged indoors. That was a mess. My house, taken over by my garden. As winter approached, I needed to get them all somewhere stable. My research suggests that all my cacti and many/most/all? of the succulents want to be dry in the winter. The cacti want no water. For the plants I bought directly that were Zone 3-7, I bought a cold frame, put some flat stones under it, and set all those plants in there. The temperature wasn’t hugely raised by the cold frame except on sunny says, but they were kept dry. The rest… came indoors. Gregory was a champ, because this was just a few weeks after the hysterectomy, so I couldn’t lift even the medium-sized pots. From early November until just this past weekend, I had about 15 plants inside on a coffee table right under one of the two windows in my apartment. 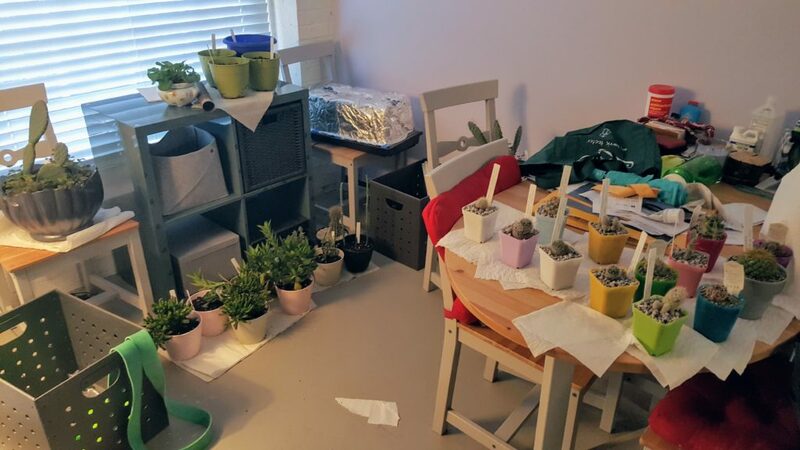 All the succulents had to come indoors, and several cacti. Gollum Jade, early spring 2018 after a loooong winter indoors. Luckily, my cats were pretty disinterested in them, because they’re all poisonous to them. Despite the fact that “Zone 7” doesn’t sound far off from “Zone 9” (e.g., Phoenix, AZ), our last frost is traditionally late March/early April, I think. Hell, we just got snow last week (mid-March), even though it didn’t stick. So my most fragile cacti are still indoors, even though I’ve finally kicked the succulents outside. With those outside, my winter impulse buys incorporated, and some new stuff about to be shipped to me (some storefronts wait until your zone is ready for planting), it’s time to kick off 2018. Plans, details, and pictures up next. If you want to see my day-to-day pictures, Instagram or Mastodon are the ways to go.